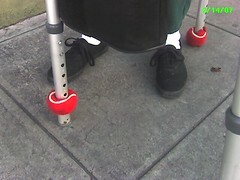 A lady in downtown Palo Alto let me take a picture of her walker legs, which exemplify one of the failings of a common user hack to make walkers actually work: tennis balls over the feet. Problem is, tennis balls are made of low impact rubber, which doesn't perform well under the duty cycle of scraping along pavement all day. This is broken.